I’ve finally decided to participate in Joy in The New Year over at Tallgrass Prairie Studio. Unfortunately i dithered after i first saw it so now have 2 weeks less than i should have to complete, although I guess as no one’s going to come and lynch me if i don’t get them all finished so i might as well have a stab at it. Here’s my list and i think i might have bitten off more than i can chew. All the quilts are quite large (approx 72” x 84”) so they’re not ones that i can get done that quickly. I considered cutting them all in half as then they’d all be half the size and really quick to do, but then i realised that would just double my UFO list – so that wouldn’t work! 1. Hexagon pinwheel – to finish quilting (I’m just over halfway) bind and label. 2. Whirlygiggle – to quilt, bind and label. 3. Orange and teal log cabin - to quilt, bind and label. 5. Sue Spargo wool quilt – to HAND quilt, bind and label. 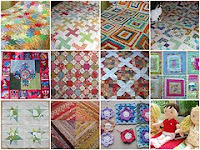 Hhhmmmm, not sure adding one that is going to be hand quilted to the list is the best idea I’ve ever had! 11. Sew flowers on crochet blanket. As yet i have no plans for New Years Eve. It’s a good job really!